Through November 22 (day 124 of the year-long challenge) I’ve been doing various numbers of exercises. In particular, I’ve recently been doing a “pull-ups program” designed to get me from being able to only do 2 or 3 lousy pullups, to being able to do a few sets. 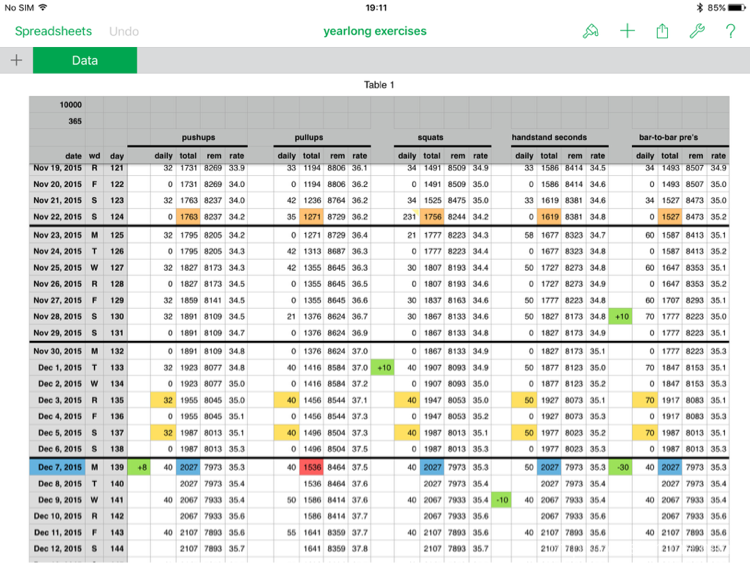 The orange cells show [what I call] the “odometer problem”: pushups and squats are close in the 1800 range, but pullups are way behind, with handstand-seconds and bar-to-bar precisions adrift in the midlands. Green cells remind me where I’m changing numbers, and yellow cells are planned; That’s the number of reps I should do — so this screenshot is from before December 3rd. That leaves pullups (the red cell) a wopping 500 reps behind the other four. Going forward from the 7th, I’ll keep the other four activities in lock-step and work as hard as I can (without injuring myself) to crank on that pullups number. If I get the math right, I think I can make all five activities come together AND pass 3,000 in a workout near the end of January.